Discussion in 'Vaping mods Reviews' started by trlrtrash13, Sep 15, 2015. This is a 50 watt bottom feeder mod. It is designed to be used with a bottom feeding dripping atomizer. It has a 510 connection so it can, of course, be used with any 510 device. 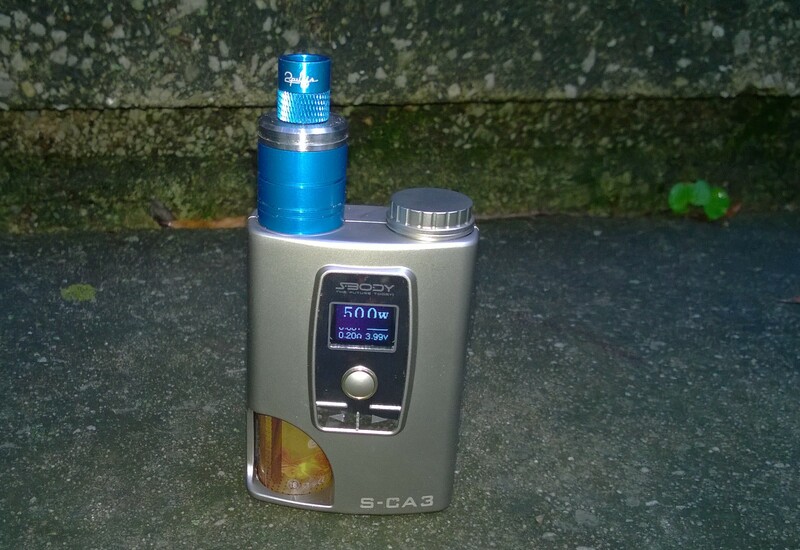 For this review, I used my modified Quicksilver atomizer and a Velocity with the bottom feeder pin installed. First off, the device does come with a bottom feeder atomizer. I can't really give an opinion on it, however, as mine was missing one of the post screws when it showed up. That aside, it doesn't appear to be a very good atomizer and with the introduction of some reasonably priced bf atties like the Velocity clone and the Steam Crave Aromamizer, I would recommend picking up one of those for using with this mod. Let me start by giving you the drawbacks to this device. First, it does not have a spring loaded 510 as advertised. It is fix mounted, so atomizers won't always sit flush on the device. Not a huge deal for me, and the ones I used come pretty close to sitting flush, but it shouldn't be advertised as being spring loaded when it isn't. The ohms readings are also off on this device. It generally fluctuates around 500ths of an ohm on any device you use on it. Meaning, if you build to .25 ohms it may read at .27 or .23, and it will fluctuate back and forth as you use it. I tested both atomizers on another mod that read them correctly each time, so it is the device and not my builds. The battery life is not great on this device. Of course, I am vaping it at 50 watts with a .25 ohm dual coil build and it takes a single 18650, so I wasn't expecting much. However, once the battery drops below 3.5 volts the output power starts to drop. It will still say 50 watts, but if you look at the applied voltage reading you will see it drop. The device falls short (barely, but still short) of it's 50 watt limit with builds below .35 ohms. Testing the output with a voltage meter, I am only getting 46.8 watts at full power. No biggie, but worth noting. With a .4 ohm build I am getting the full 50 watts. The device is also advertised as a passthrough. What they really mean is that you can vape as it charges. However, with a fully drained battery you will have to wait for it to charge into a usable range to be able to vape it. It's not actually a legitimate passthrough. Now, on to the good parts. It works. It actually works quite well. For the price, you're getting a great little device. It should be noted that squonkers are quite expensive. Coming in at $65 and offering VW up to 50 watts, this is very inexpensive and packs a lot of power compared to the competition. It also has a 10 ml bottle which is nice, but you will need to peel the label off of it when you get it so you can properly see your liquid level. It is very comfortable in the hand, and although the fire button is placed in an odd location I got used to it pretty quickly.